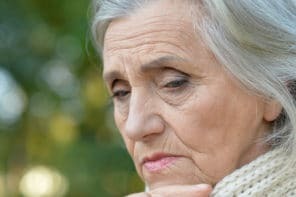 Older adults with hearing loss may struggle with everyday tasks like answering the phone or door, knowing when there’s a fire, watching TV at a reasonable volume, or simply talking with people. We found 10 useful aids that help hearing impaired seniors be more independent and make everyday life easier and more pleasant. These aids can also improve life for other people – no more enduring a blaring TV or repeated shouts of “WHAT?” when trying to have a conversation. A door bell chime with flashing lights let seniors with hearing impairment know when someone is at the door. Attach this simple device between the telephone jack and a lamp to get a flashing light indicator when the phone rings. This signaler helps with both door bells and phone calls. It flashes a lamp to alert when someone is at the door and also flashes to alert when the phone rings. Safety is the first priority for seniors, especially those living independently. A smoke alarm is only useful if your older adult knows that it’s going off. This smoke detector has a strobe light so they can see any alarms. An extra loud alarm clock with bed shaker helps hard-of-hearing seniors get up on time. Use just the silent shaker, the super loud sound, or both. We’ve also written a more detailed review on this alarm clock here. This wireless headphone set allows seniors to turn up the TV volume as loud as they need without disturbing anyone else. If others are watching too, you can keep the TV sound on its own volume level. This device projects sound from the TV to a wireless speaker you can put right next to your senior (or anywhere in the room). That makes it much easier for them to hear the TV. And, the speaker’s sound is controlled independently from the TV’s volume. This affordable and effective hearing amplifier has excellent reviews on Amazon. It’s lightweight, can be worn in either ear, and has simple settings to adapt to different sound environments. The long-lasting batteries mean less fuss and the low price tag means less worrying about it getting lost. This sound amplifier is great for seniors who don’t want to wear hearing aids. It boosts sound closest to the listener and reduces background noise. It works well for one-on-one conversation, in small groups, watching TV, or talking in the car. It can be used with or without hearing aids. This hearing amplifier is expensive, but still far cheaper than a hearing aid – and it has excellent reviews on Amazon. It has 10 volume levels, 4 preset memory programs, and can be easily adjusted. All prices quoted were checked shortly before publication, but prices change often and might not match what is found online. This article wasn’t sponsored, but does contain affiliate links. We never link to products or services for the sole purpose of making a commission. Recommendations are based on our honest opinions. For more information, see How We Make Money.